For over five generations, National Geographic magazine has dazzled and educated people with incredible photography and gripping stories spanning the four corners of the earth and the deepest oceans. Inspired from our monumental Around the World in 125 Years, this volume curates over 200 captivating images, sourced directly from the National Geographic historical archives, including just under 40 new photographs. 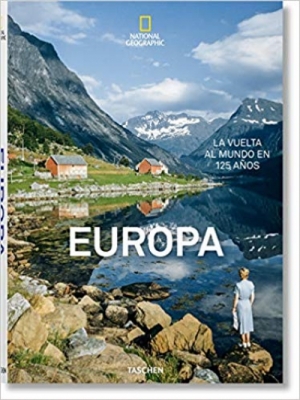 Traversing travel, history, culture, social documentary, and conservation, this compendium is in equal parts a breathtaking homage to the spirit and diversity of Europe, and a unique tribute to the world’s most famous photography magazine. National Geographic pioneered the aesthetic of the photo essay, while continually pushing the medium's technical boundaries to both entertain and enlighten its millions of loyal readers. Our trans-continental journey through time and space spans across all corners of Europe, from the snow-specked peaks of Finland to the frothy soap discos of Ibiza, from the serene blue waters of the Greek Islands to the Lascaux cave paintings of Southern France. We witness the hair-rising eruption of Surtsey in Iceland, where lightning rips through the volcano’s clouds in otherworldly hues of purple; lose ourselves among flowers and babushka-wrapped heads in Russia’s Volgograd marketplace; and tread carefully behind climbers across a crevasse in the Bernese Oberland. Along the way, we absorb the culture of the some of the world’s greatest cities including Paris, Rome, Berlin, London, Vienna, Stockholm, Moscow, and many others.